One of the current controversies that I want to explore in this blog is the resale of eBooks. Calm down, everyone. Go to your happy place. OK, I’m not going to discuss eBook resale directly in this post; instead, I want to lay some of the groundwork for that discussion by providing some basic information about copyright’s first sale doctrine. If you purchase a BluRay of the Firefly TV series and then give it a friend,* are you a copyright infringer? Is the owner of Redbox a copyright infringer for renting a BluRay disc of The Avengers? What about the proprietor of a used bookstore, or a customer of the same? Intuitively, you probably know the answer to all of those questions is no. The first sale doctrine is the reason the each of those commonplace activities is not an act of copyright infringement. Hallie Erminie Rives in a kimono. I don’t know why she is in a kimono. At the beginning of the 20th century, Hallie Erminie Rives was a best-selling author as well as being a daughter from one of the oldest families in America and the wife of a prominent diplomat. Her books included Satan Sanderson, The Kingdom of Slender Swords, and The Valiants of Virginia, as well as Smoking Flax, controversial even when published in 1897 for its positive portrayal of a lynching. 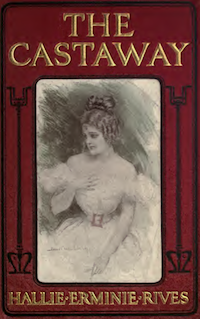 One of her other novels, The Castaway, was at the center of Bobbs-Merrill Co. v. Strauss et al., doing business as R.H. Macy & Co., the 1908 Supreme Court case that first established the first sale doctrine in the United States. The original cover. Since the book sells itself as telling the story of three men whose lives are ruined, I’m not sure why there is a woman on the cover. Unless it’s her fault that … OK, I’m not going there. 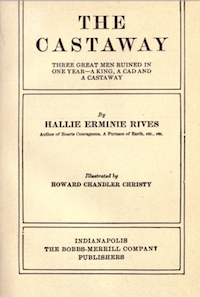 As an aside, the copyright in The Castaway expired a long time ago, meaning it is now in the public domain. That means, among other things, that you can probably find a lot of presses you’ve never heard of offering it for sale on Amazon. Of course, you can also find it available for free here if you want to take a look. Now, back to the history of the first sale doctrine. OK, maybe not just yet. In the past few days, we’ve all been reading about the Apple decision and the attempts of big publishers to control prices, more specifically about publishers trying to find some way to force Amazon higher than their $9.99 price point for eBooks. Well, I’m sure you didn’t think that was the first time publishers tried to control the prices of their books. The underlying facts in Bobbs-Merrill v. Strauss were strikingly similar at least with respect to each party’s goals. The publisher Bobbs-Merrill wanted to maintain a price point of $1 while the department store Macy’s wanted drive foot traffic to its store by offering popular books at below market prices. Sound familiar? The price of this book at retail is one dollar net. No dealer is licensed to sell it at a lower price, and a sale at a lower price will be treated as an infringement of the copyright. Macy’s purchased the book wholesale and resold them for 89 cents. Bobbs-Merrill in turn sued them for copyright infringement. Bobbs-Merrill did not allege that Macy’s had copied the book, but rather they alleged that Macy’s had infringed their “right to vend” the copyrighted work. Most people think of copying when they think of copyright, and certainly the right to exclude others from making unauthorized reproductions is the central right granted to copyright holders. However, there are other rights. The Copyright Act of 1790, the applicable law in 1908, also included the “right to vend” the copyrighted work. The Copyright Act of 1976, the currently applicable copyright law, words this right as the exclusive right to distribute copies of the work. The Supreme Court rejected Bobbs-Merrill’s argument that Macy’s resale of the book for les than the price specified constituted infringement of the copyright. Instead, they said that the right to vend granted by the copyright statute did not include the right to control resale of copies of the work after those copies were initially sold by the publisher. Note that the Court was explicit about its holding being an interpretation of the Copyright statute and not involving any claim of a contractual obligation created by the language printed in the book or otherwise. The statute, through later amendments, places some very interesting limitations on the first sale doctrine, as do later cases, particularly those involving shrink-wrap licenses on software. However, I will leave those for later discussions. The first sale doctrine is often referred to as a doctrine of exhaustion – as in, the copyright holder’s rights in that particular copy are exhausted by the first sale. Another way to think of the first sale doctrine is to think of it as a balancing between two sets of property rights. The copyright owner holds one set of property rights, the copyright rights. The owner of an individual copy of a work holds the other set of property rights, the personal property rights in the physical object itself. Remember that copyright law and the statute explicitly distinguish between the copyrighted work of authorship (an intangible) and a particular embodiment of that work (a tangible book, disc, print, etc,). The statute, in an apparent attempt to make the wording as confusing as possible, calls these embodiments “copies.” Except in the case of music, which for historical reasons the statute refers to as phonorecords. Don’t get me started on music copyright, the parachute pants of the copyright world. So the owner of a physical object has personal property rights in that object. Just as copyright gives you a bundle of rights, so too personal property gives you a bundle of rights. One of those rights is the right of alienation. Now, that doesn’t involve bald aliens who get drunk on sour milk. The right of alienation basically means that the owner of property has the right to transfer the property rights to someone else. So the conflict, and the need for balancing, then comes from the copyright holder’s exclusive right of distribution and the copy owner’s personal property right to alienate the copy. Section 109 and the first sale doctrine resolve that conflict. The copyright holder does have the exclusive right to distribute any copies of the work, but once the copyright holder has parted ways with a particular copy, the right of distribution no longer applies to that particular copy. The distribution right is exhausted by the first sale. Note that even though we call it the first ‘sale’ doctrine, the relevant distribution is any transfer of ownership whether it is a sale or a gift. That’s the first sale doctrine in a nutshell. Hopefully, that will provide a foundation for later discussions of whether the first sale doctrine applies to virtual objects, such as eBooks. *One of the greatest things a friend can do, by the way. What is lex scriptoria? It’s Latin for “the law of writers” and is my conception of what this blog is about. I created it to be evocative of the well-known phrase lex mercatoria. OK, well known if you are a legal historian. All right, a legal historian interested in medieval commercial law. Lex mercatoria refers to a body of customs and rules that were developed by merchants during medieval times. It is Latin for the “law of merchants”. 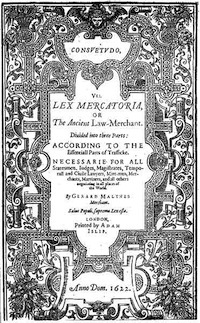 Lex mercatoria served as an international set of laws enforced by tribunals of merchants separate from either governmental or ecclesiastical courts of the day. It declined as stronger national systems, including national commercial codes, arose in the late medieval period, but the national codes were often adapted from lex mercatoria, and courts still looked to lex mercatoria in commercial disputes. It eventually came to be used as a general term for commercial law itself. So, for me, lex scriptoria describes a subset of law and custom. It is all the law relevant to writers as well as the customs, or practices, of those in the business of writing. While lex scriptoria includes actual law – statutes and cases – note that it also includes the practices of those in and around the world of writers. In the law plus practices formulation, I bring expertise in the former and an interest in the latter. I hope that his blog serves a useful device for exploring both. I plan to focus both on newsworthy issues as they arise and on the general background of law that writers might want to know. My hope in doing so is that this blog will serve both to explore and to elucidate lex scriptoria. First warning. You should stop reading. OK, you should probably stop reading now, as I continue to discuss my choice of lex scriptoria. Seriously, we’re going to dip down into the Latin. In attempting to come up with the writer equivalent of lex mercatoria, I debated whether to use the latin base word scriptor or the base word auctor. Scriptor is most commonly translated as “writer” and auctor as “author”. There are four ways of making a book. Sometimes a man writes others’ words, adding nothing and changing nothing; and he is simply called a scribe [scriptor]. Sometimes a man writes others’ words, putting together passages that are not his own; and he is called a compiler [compilator]. Sometimes a man writes both others’ words and his own, but with others’ words in prime place and his own added only for purposes of clarification; and he is called not an author but a commentator [commentator]. Sometimes a man writes both his own words and others’, but with his own in prime place and others’ added only for purposes of confirmation; and he should be called an author [auctor]. This quote is frequently cited as quite extraordinary in how close it comes to capturing modern conceptions; however, a deeper reading of St. Bonaventure’s text reveals that his conceptions of writer and author were not as close to modern thought as this particular passage seems to convey. While the term scriptor is often equated to one who scribes, in other words as the person who literally writes things down, and auctor seems closer to author, neither term really captures the modern conception of either writer or author. I eventually chose to use lex scriptoria instead lex auctoria for four reasons. First, I wanted a term that was closer to writer than author. Second, the Latin word auctor has a rather broad meaning and many different connotations and uses. In fact, it is more commonly used to mean “authority” or “power”. It is the source of the modern word “authority”. Third, at least one Latin scholar* I talked to said scriptor came closer to our modern conception than auctor. Finally, I just liked the sound of lex scriptoria better than lex auctoria. Second warning. You should stop reading. If you haven’t stopped reading by now, you really should. Don’t say I didn’t warn you. So, having chosen to use scriptor instead of auctor, I was then left to create the correct phrase together with lex, which in case you have not deduced it yet from the context means law. So I dug back into Latin grammar. Both scriptor and auctor are third declension nouns. I decided to use the genitive case, which is fairly close to what we think of as a possessive form of nouns. This should have yielded an acceptable phrase for the “law of writers”. However, the genitive plural third declension ending is -um, yielding lex scriptorum. The problem with that construction was that the word for merchant was mercator, also a third declension noun. So why was the well known phrase lex mercatoria instead of lex mercatorum? I eventually found the answer, confirmed by my expert*, by searching through all possible Latin endings until I found -ia listed as an adjectival form of nouns, including third declension nouns. Using the genitive/possessive was incorrect; I needed the adjectival form of the word. Thus, lex scriptoria, the law of writers. Just for the record, I did warn you to stop reading way back up there somewhere. You can’t blame me if you kept reading anyway. *Dr. Gaffney, my eighth grade Latin teacher. Dr. Gaffney knows his stercore; you don’t question Dr. Gaffney.